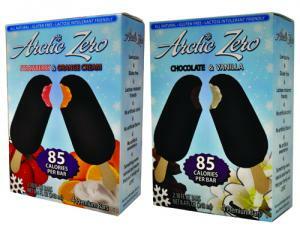 Arctic Zero offers a new frozen dessert that is low-calorie, high-protein, gluten-free and lactose intolerance-friendly. Can it possibly be satisfying as an alternative to ice cream? Often they are very small, which can be unsatisfying. They also tend to lack any nutritional value, so they are sweet but don't really have a valued place in the day's caloric intake. Arctic Zero's new frozen products are not only fat-free and low-calorie at 150 calories for an entire pint, but they pack 14 grams of protein into that amount. Low on the glycemic index, their ice cream substitutes are also gluten-free, kosher, high fiber and contain no artificial flavors, colors or sweeteners.The protein content comes from whey protein, so while many people who are lactose intolerant can consume it, it is not dairy-free. While most of their products are sold in scoopable pints, they also have two flavors that come in 85-calorie dessert bar form: Chocolate & Vanilla and Strawberry and Orange Cream flavors. The cookies and cream flavor is smooth without actual cookie pieces. It has a mild chocolaty flavor, not unlike a better-tasting chocolate protein shake. The texture, while not as creamy and rich as ice cream or premium frozen yogurt, is smooth and pleasant. It has a nice sweet flavor, not commonly found in products this low in calories without artificial sweeteners or sugar alcohols. How do they do it? A blend of organic cane sugar and a concentrate of a very sweet melon called monk fruit give this dessert its sweet nature. Arctic Zero freezes harder than ice cream when stored at the same temperature. Leaving it on the counter for ten minutes or zapping it in the microwave for a few seconds makes it much more scoopable. Want to try Arctic Zero yourself? Their web site's store locator helps make it easy to find a retailer near you. Can't find it locally? Amazon will ship it to you packed in dry ice! While it does not qualify as a decadent dessert, Arctic Zero ice cream is a satisfying treat. Having a guilt-free indulgence every now and then can make dieting a little bit more fun! 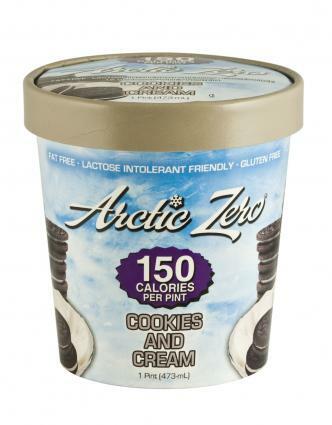 Arctic Zero provided sample pints of the Cookies and Cream flavor for this review.